Millions of people across England and Wales can now sign their mortgage deeds online, as high street lenders sign up to use the service. As well as making it easier to remortgage, HM Land Registry is also looking to the future through its Digital Street research project and has successfully used a blockchain prototype to show how buying a home can be made simpler and quicker. People are doing an ever-increasing amount online, from shopping to banking, e-learning to gaming. Now they can remortgage their home online as it’s quicker, more convenient, and fits their busy lives. HM Land Registry’s digital transformation is continuing to make it easier for homebuyers by embracing new technologies like blockchain, enabling them to become the world’s leading land registry. 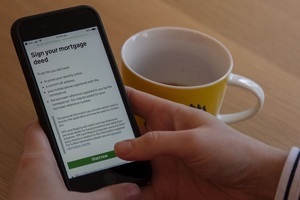 One year on from the signing of the UK’s first digital mortgage deed, HM Land Registry’s digital service ‘Sign your mortgage deed’ is now being offered by major high street lenders. The digital service enables people to sign their mortgage whenever and wherever they are, including on their phone or computer. It removes the need for ‘wet’ (pen-on-paper) signatures, and witnesses no longer need to be present when the documents are signed. Homeowners no longer face delays from having to print out forms, find an independent third party to witness their signature, and pay to return the forms by post. Nationwide, HSBC, RBS and NatWest and Atom Bank were among the first mortgage lenders to sign up, allowing their customers to use the new service. More people are applying for their mortgages using paperless processes and HM Land Registry’s free service brings the sector one step closer to an end-to-end paperless process. We have been extremely pleased with how the whole application, including the online mortgage deed worked. The speed from initial contact to completion of the new mortgage was astonishing. The HM Land Registry digital mortgage service is an example of the Government delivering world-class services that offer people value for money and that are built around their needs. The #SmarterGov campaign aims to drive innovation, savings and public service improvement across the public sector. As well as helping homeowners today, HM Land Registry’s successful Digital Street research and development project is looking at ways of improving the homebuying process in the future. HM Land Registry has rigorously tested the technology and has successfully used their blockchain prototype to show how buying and selling a home can be made simpler, quicker by demonstrating a digital transfer of ownership. It was really straightforward. It shows how technology like this can help make everything so much quicker and you can see clearly what’s happening at every stage. If this is the way forward, it’s going to make everything easier. The prototype has been developed as part of the organisation’s Digital Street research project. The blockchain technology has been developed through conversations with stakeholders across the property market, and tested with the close cooperation of Mishcon de Reya, Premier Property Lawyers, Shieldpay and Yoti. The following lenders are all now ready to use the digital mortgage service: Atom Bank, Coventry Building Society, Clydesdale Yorkshire Banking Group, First Direct, HSBC, Metro Bank, Molo Finance, Nationwide and The Mortgage works, Platform (a trading name of the Co-operative Bank), Principality Building Society, RBS and NatWest, Santander, Skipton Building Society and West Bromwich Building Society. The following conveyancers are now ready to use the service: Enact, Hugh James, MyHomeMove and O’Neill Patient. Customers with the mortgage lenders listed above should talk to their customer support team about using the free and fast new service. HM Land Registry is working with other mortgage lenders and conveyancers to help them get ready to use the new service. Mortgage lenders and conveyancers who are interested in using the service should contact digitalmortgages@landregistry.gov.uk. The service has been shaped with support and feedback from Coventry Building Society and Enact Conveyancing during the initial development phase. Using the ‘Sign your mortgage deed’ service will mean the borrower will no longer need to apply pen to paper and will instead digitally sign their deed online. Borrowers will save time as they won’t have to get their signatures witnessed or risk their documents being lost in the post. They will be able to log in and sign their deed at any time, meaning their application is more likely to move along more quickly. To sign their deed, the borrower uses GOV.UK Verify to confirm their identity. This provides an additional level of identity assurance that does not exist when signing a paper deed. The digital deed is also more secure than a paper deed as it is always held on HM Land Registry’s IT infrastructure so cannot be lost or tampered with. The first digital mortgage was registered on 5 April 2018 on a house in Rotherhithe, London. The service is currently available for people applying for a remortgage on their house, with no immediate plans to expand to all mortgages until further testing is complete. Conveyancers and lenders who would like to sign up to use the service can contact HM Land Registry’s digital mortgage team by emailing digitalmortgages@landregistry.gov.uk. Recent UK Finance figures show that the lenders using the service collectively hold 58.2% of the market share of mortgages. In January 2019 there were 47,400 remortgages representing £8.7bn. The ‘Sign your mortgage deed’ service is just one of many innovations from HM Land Registry which the organisation is hoping to introduce to make the buying, renting, selling, financing, building and managing property easier. The recently launched Local Land Charges Register will bring data from local authorities across England and Wales to a central database. This will remove the need for manual searches in overworked local offices and remove weeks of potential delays from each sale. The data from five local authorities have been successfully transferred so far, including Warwick District Council, City of London and the Isles of Scilly. Homebuyers can use the ‘Find Property Information’ service to quickly find information about properties they are interested in at the start of the transaction, rather than waiting until an offer has been accepted. Running in parallel to all new service development is ‘Digital Street’: a research and development project designed to drive innovation with the aim of making buying and selling property simpler, quicker and cheaper. Now in its second year, the project is exploring the use of blockchain technology and smart contracts to bring greater transparency, speed and trust to property transactions. The project engages key stakeholders from across the industry, including PropTech (property technology) specialists, data experts, conveyancers, property developers, mortgage lenders and others. Over the coming years HM Land Registry will be exploring how innovative uses of technology can make the land registration process simpler, faster and cheaper. HM Land Registry safeguards land and property ownership. The Land Register contains more than 25 million titles showing evidence of ownership for some 86% of the land mass of England and Wales. HM Land Registry’s mission is to guarantee and protect property rights in England and Wales. HM Land Registry is a government department created in 1862. Its ambition is to become the world’s leading land registry for speed, simplicity and an open approach to data.